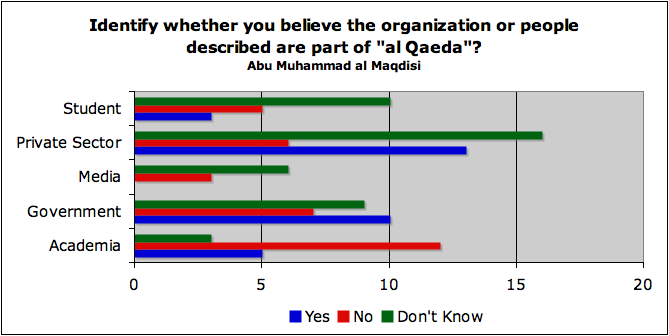 This is the final batch of results from the "What is Al Qaeda" survey, conducted with major assistance from Clint Watts of SelectedWisdom.com. 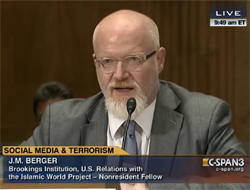 Part 2: Which groups are part of the U.S. war on Al Qaeda? 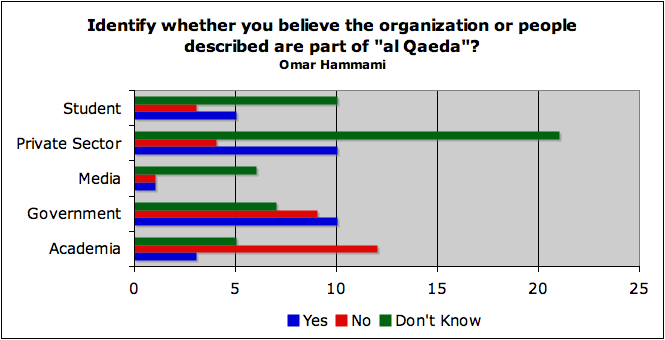 The third and final question in the survey asked about specific people and whether they are part of Al Qaeda. Click here to see the count for each category, or check out the percentages below. The results for this section were very much influenced by lack of information. As with the previous results, I have broken out academic and government responders for closer scrutiny. Given below are the percentage of "yes" votes as compared to "no" votes only (i.e., "don't know" answers were not counted). Yellow blocks show votes with less than two-thirds consensus, red blocks highlight near 50-50 splits. As you can see, government responders were much less likely to find consensus on these questions than academics, which is significant given that government employees are more directly responsible for implementing policies and making decisions about targeting. However, the sample size is so small (and the pool of government responders so diverse) that these figures should be used very cautiously when drawing conclusions of any kind. That said, the results are quite interesting and rather confusing, often failing to apply the criteria for Al Qaeda affiliation outlined in Question One or specific groups identified in Question Two. So, for instance, the responses on Abu Zubaydah were quite strongly in favor of considering him part of Al Qaeda despite there being some confusion about this issue in the public record. A majority of every professional group in the survey voted to include Ramzi Yousef in Al Qaeda, although the margins varied, with both government and academics failing to reach a two-thirds consensus. Relatively few people voted "don't know." While Yousef was known to have trained in Al Qaeda camps, the evidence that he acted at the direction of Al Qaeda is somewhat thin, and the evidence he was financed by Al Qaeda is significantly disputed. That said, there is enough evidence to make the argument and probably succeed in doing so, but it's hardly a slam dunk. In contrast, the overall vote on Omar Abdel Rahman was sharply split and government voters went straight down the middle on the question. With some caveats, there is reasonably strong evidence that Rahman was signficantly financed by Osama bin Laden while he lived in America, and he effectively led the Al Kifah Center in Brooklyn, which was at least loosely affiliated with Al Qaeda, if not a full-blown "Al Qaeda outpost" as recent reports have mostly characterized it. You can find more on this in my book. Here are a couple of charts showing a couple other interesting divergences in the data. For both Omar Hammami and Abu Muhammad Al Maqdisi, we saw wild swings in the data. I will probably try to assemble some thoughts on this later. For now, I just note it. This is the final installment of the results. I am going to ponder these numbers for a while, trying not just to make sense of them but to draw some useful conclusions and talk about how they inform our national discussion about terrorism. In the meantime, feel free to drop in and discuss your thoughts with me on Facebook or Twitter. Finally, many thanks again to Clint and SelectedWisdom.com for making the charts above and for making the overall survey happen. A lot of work went into both assembling the survey and making the results comprehensible, and it is much appreciated.